This is the powerful true story of 15 year old BJ Higgins, an ordinary young man with an extraordinary dedication to sharing the gospel. Stricken with a deadly infection on the mission field in Peru, BJ kept witnessing to the love of Christ even as he lay dying. 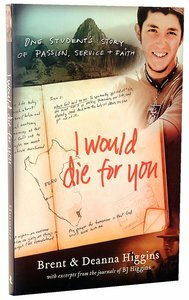 About "I Would Die For You: One Student's Story of Passion, Service and Faith"
Brent Higgins is an ordained minister and youth pastor. He currently serves as vice president for international operations for Awe Star Ministries, a Christian non-profit organization committed to equipping believers for life, speaking to 25,000 people each year. Deanna Higgins is an accomplished musician and elementary school music teacher. She also serves alongside her husband, leading mission trips for Awe Star Ministries. Brent and Deanna now live in Tulsa, Oklahoma. Customer Reviews For "I Would Die For You: One Student's Story of Passion, Service and Faith"
This book is amazing. It is encouraging me to live my life for God. I feel like BJ is the guy half of me. But I know that there are things that he was that I haven't come to be yet, and thats where it encourages me to keep going, and to keep growing in God. I advise you to get your kids (no matter what ages, but Im a teen so mainly for there) to read this book cause if you want your kid to grow up in any kind of way to be like someone this is it. Inspirational and awesome. For more than the teen age group.